First of all Merry Christmas and Happy New Year! You can earn the badges on this 25th and on the 1st of January 2014. For the comming year we have planned to add another POP in singapore as BeeIMG is highly popular in Asia. It will reduce latency and give faster upload speeds. We will be redesigning the upload page for faster and for a simple UI. More responsive design for mobile devices in also under consideration. In the next year we are planning to a making referral bounty program so you can earn some bucks when you referer your friends to BeeIMG. In the this year we have hosted more than 3,000 images, have served nearly 25 million image views using 6 TB of bandwidth. we will be posting updates on our Blog, Twitter, Facebook and on Google Plus pages when new features are made public. 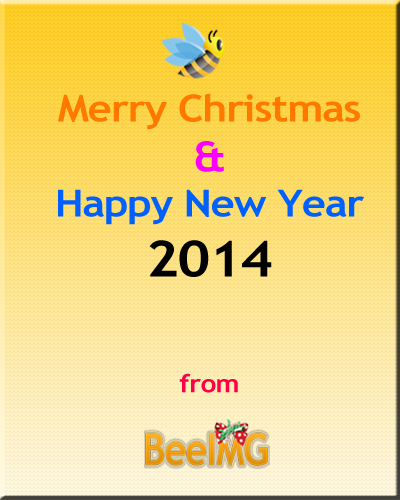 At last we are taking this opportunity to thank everyone who made 2013 a very big success. Thank you!